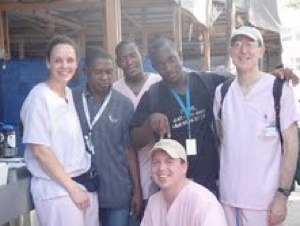 Thorner and Dr. Jeff McLean, traveled to Haiti with the University of Maryland, specifically Shock Trauma (Dr. Blitzer is a trauma surgeon). We were under the protection of Catholic Relief Services. There were 12 members on our team total, comprised of 2 surgeons, 1 anesthesiologist, several ID MD's, 2 surgical techs, and nurses, a nurse practitioner, and myself. We were supposed to go to our regular hosptial (St. Francoise de Sales) the entire time, but because of security reasons, we went to a different hospital set up by the University of Miami one day. 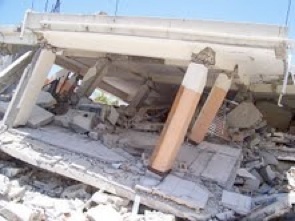 The hospital was devastated by the quake, and many of the patients and workers were still buried in the building. two months prior and was crutching around that entire time! Unfortunately, again because of security, there was no medical personnel at the hospital in the evenings or overnight - so the families had to take care of the patients for that time - including all the fresh post ops. At the University of Miami hospital, there was a lot of acute trauma as there has been a bus accident two days prior. Apparently there were several Americans on the bus that were flown to the US - and the Haitian injuries were devastating. We felt fortunate because we were staying in a house with showers (cold but actually felt quite good), whereas they were staying in a large tent on cots, shoulder to shoulder. 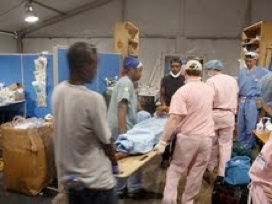 The hospital tents were not air conditioned and temps that day were around 100 (as they were most days). 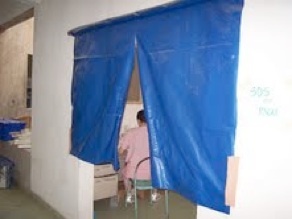 It was not unusual for me to be sweating all over the patients. Patients at St. Francoise de Sales were given cards with their diagnosis, the procedure that was performed, and the day they were expected to follow up. They all carried their own xrays. Many had external fixators, and kept their pin sites immaculate. 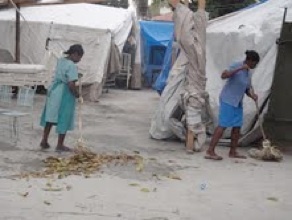 In addition, the dressings were usually very clean, which would be extremely hard to do given many didn't have any homes left and were living in tents. 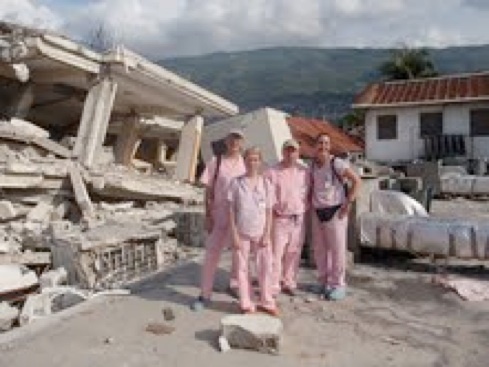 They were very wary about amputations, given how many were performed the first couple of weeks after the quake. 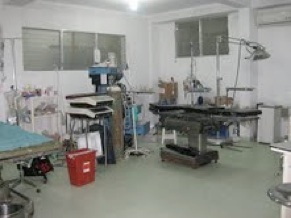 In fact, three patients never did end up showing up for the surgery, we believe, because they were afraid of amputation. We ate a breakfast at the house, usually ate protein bars for lunch, and either had pizza (Dominos if you can believe it) or went out to eat at some very nice restaurants. Felt somewhat guilty about it but also felt as though we were supporting the economy is some ways. Bronna Eckelman of Sanford, Maine, is pictured in front of the ruined hospital, St. Francoise de Sales. 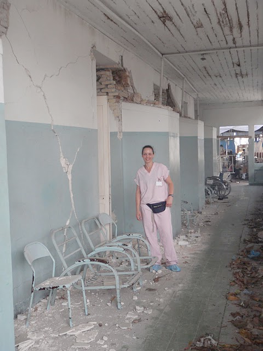 Special thanks go out to Bronna Eckelman, a Physician Assistant from Sanford, Maine, who submitted the information about Seacoast Orthopedics and Sports Medicine’s May 2010 visit to Haiti. 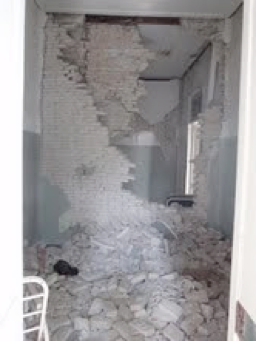 She and her supervising doctor, Dr. Charles Blitzer, and Jill Thorner and Dr. Jeff McLean spent time at two hospitals, providing medical support and surgical intervention. 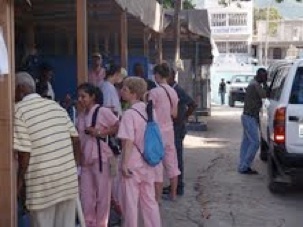 Both hospitals (St. Francoise de Sales and the University of Miama) were located in Port au Prince. Dr. Charles Blitzer, Jill Thorner, Dr.Jeff McLean, and Bronna Eckelman.